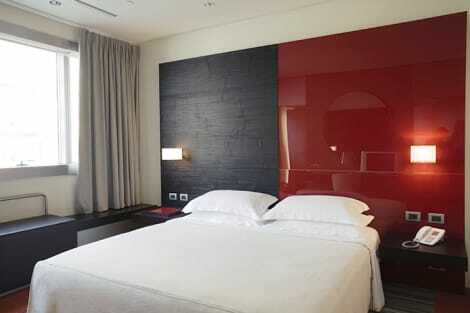 T Hotel is an ultra-modern hotel set in central Cagliari, opposite the Lyric Theatre. It is 1.5 km from Cagliari Cathedral and 10 minutes' drive from Poetto Beach. The T Bar, T Bistrot and T Restaurant serve contemporary Sardinian flavours, including vegetarian, low-sodium and gluten-free options, and you can unwind in the T Spa and T Fitness gym, stocked with a selection of cardio equipment. All rooms have wi-fi access, soundproofing, air conditioning, TVs and private bathrooms. Located 500 metres from Cagliari’s Port, Hotel Dedoni is set in Cagliari’s historic centre, 5 km from the sandy beach of Poetto. It offers classic-style rooms with free Wi-Fi and air conditioning. Featuring a flat-screen TV, all rooms come with a minibar and parquet floors. The private bathroom includes a shower and hairdryer. A sweet and savoury buffet breakfast is served daily in the breakfast room. Guests can enjoy a snack at the bar. Hotel Dedoni is a 20-minute walk from Cagliari’s Roman Amphitheatre. The Cagliari Elmas Airport is 8 km from the property. Make yourself at home in one of the 122 air-conditioned rooms featuring minibars and LCD televisions. Complimentary wireless Internet access keeps you connected, and satellite programming is available for your entertainment. Private bathrooms have complimentary toiletries and hair dryers. Conveniences include desks and complimentary newspapers, and you can also request irons/ironing boards. Take advantage of the hotel's room service (during limited hours). Wrap up your day with a drink at the bar/lounge. A complimentary buffet breakfast is served daily from 7:00 AM to 10:30 AM. 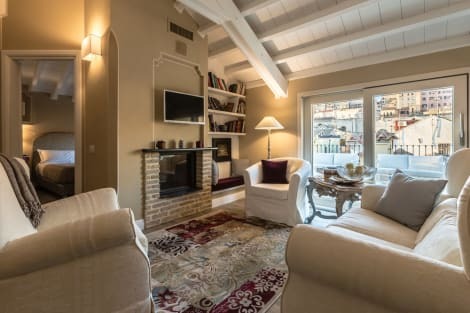 A stay at Sardegna Hotel, Suites & Restaurant places you in the heart of Cagliari, a 4-minute drive from San Michele Castle and 8 minutes from Tuvixeddu Necropolis. This 4-star hotel is 2 mi (3.2 km) from Citadel of Museums and 2 mi (3.3 km) from Villa di Tigellio. With a stay at Hotel Flora in Cagliari, you'll be within a 15-minute drive of Poetto Beach and Port of Cagliari. 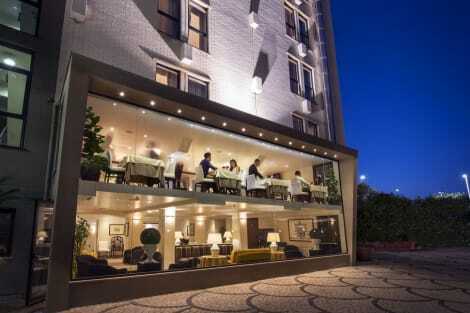 This 4-star hotel is 0.3 mi (0.4 km) from Piazza Yenne and 0.3 mi (0.6 km) from Cagliari City Hall. Enjoy a meal at the restaurant or snacks in the coffee shop/café. The hotel also offers room service (during limited hours). Quench your thirst with your favorite drink at the bar/lounge. A complimentary buffet breakfast is served daily from 7:00 AM to 10:30 AM. Satisfy your appetite at the guesthouse's coffee shop/café. Cooked-to-order breakfasts are available daily from 7:30 AM to 10 AM for a fee. Make yourself at home in one of the 17 air-conditioned rooms featuring minibars. Complimentary wired and wireless Internet access keeps you connected, and satellite programming provides entertainment. Private bathrooms with showers feature rainfall showerheads and complimentary toiletries. Conveniences include phones, as well as safes and desks. Take in the views from a terrace and a garden and make use of amenities such as complimentary wireless Internet access. Additional amenities at this hotel include concierge services, babysitting/childcare (surcharge), and a television in a common area. An area of human activity for around five millennia, Cagliari is the capital of Sardinia, an Italian island renowned for its pristine sandy beaches, ancient and medieval landmarks, and turquoise seas. For more than 500 years, the city was the capital of the Kingdom of Sardinia, which also included much of what is now northwest Italy. However, Cagliari was already a strategic settlement by the Roman period, when the large Roman amphitheatre was built which could hold up to 10,000 people. In the early 18th century, following the Treaty of Utrecht and the Spanish War of Succession, Cagliari was ruled by the House of Savoy but became a target for Napoleon, who attempted to capture the city to expand his influence in the Mediterranean. However, the Sardinians defeated him, although the House of Savoy showed no gratitude, which convinced Sardinians to expel the Savoys from the island, at least for a short time. In the late 19th century, when the island became part of unified Italy, Cagliari benefited from many attractive Art Nouveau buildings, and expanded from a community of 37,135 inhabits in 1871 to 70,132 by 1911. Probably the most formidable site in the city is Cagliari Cathedral, which is noted for its decorative Pisan-Romanesque architecture and is more than 700 years old. The building is also known for its rare medieval artwork, and was restored in the early 20th century to its original architectural style. The cathedral is part of the oldest district of the city, the castello, which also contains many other distinctive landmarks such as the San Pancrazio Towers and the Archbishop's Palace. Here, you can also walk to the Bastione di San Remy roof and enjoy a refreshing drink as you admire one of the finest panoramic views of the city.. If you're visiting in the warmer months and want to enjoy some well-earned beach time, don't forget to visit the spectacular Poetto Beach. This six-kilometre sandy bay is one of Sardinia's most famous sights, and overlooks crystal clear water that is ideal for swimming. For authentic, fresh Italian cuisine, you can't go wrong at Ristorante Martinelli's, La pizzetta d'oro or Major Preep. For delicious Gelato, don't forget to visit Stefino - Gelateria Artigiana, or enjoy some of the finest pizzas in Italy at the Pizzeria 7 Nani. For tasty Indian cuisine, head to the Tandoori Cagliari, or dine at Stella Marina di Montecristo for some delightful seafood. One of the best-value Cagliari hotels is the Hotel Italia, which offers stylish, contemporary accommodation in the heart of the city. 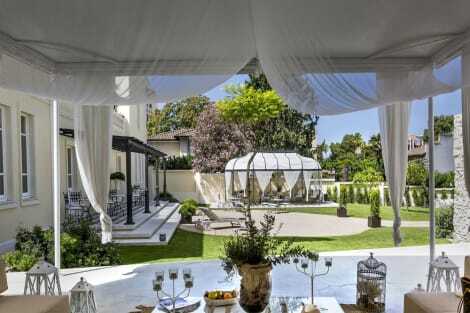 If you're after an exquisite, opulent venue, choose the Miramare Boutique Hotel with its elaborate interior, or consider the elegant but affordable Holiday Inn Cagliari.